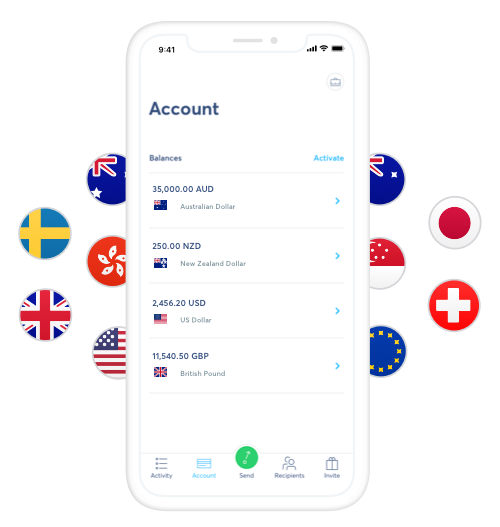 A new kind of multi-currency account — comes with 4 sets of international bank details, 40+ currencies, and the real exchange rate. Get international bank details. Instantly. 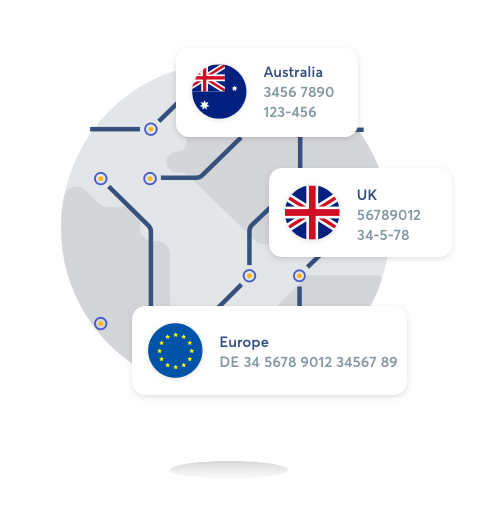 Get bank details for the US, UK, EU and Australia — it's a bit like having an account in all those countries. Receive money internationally, for free. Give your bank details to friends, clients, and customers and receive GBP, EUR, USD and AUD — for free. Hold 28 currencies in one account. Hold 28 currencies and switch between them in seconds — with the lowest possible fees, and real exchange rate. Give these bank details to clients and friends to receive Euros, Pounds, US, New Zealand and Australian dollars with zero fees. The borderless account explained in 80 seconds. 40+ currencies at your fingertips. Oh, did we mention you can also hold 40+ currencies? Switch between them in seconds — on the move, in the moment, or just when the rate is right. No monthly fees, no receiving fees - just a small charge when you convert across currencies. It works for every business. Receive your Amazon and Stripe payouts. Get paid in any currency. Do business like a local. These currencies come with your very own bank details. Anyone can use these to pay you just like they'd pay a local. Get your own Account Number and Sort Code. Get your own SWIFT/BIC and IBAN details. Get your own Routing (ABA) and Account Number. Get your own BSB Code and Account Number. Get your own Account Number. You can hold and manage money in more than 40 currencies. This lets you avoid exchange rate movements and prep for future transfers. Send money to 50+ countries. You can use money in your Borderless account to send to any of the currencies on TransferWise. How much does it cost to get a borderless account? It's free to set up your borderless account. It's free to get your international bank details, free to receive money using those bank details, and free to spend on your card abroad. There's a cheap, transparent fee to convert between currencies. You'll always see this upfront, so there's no nasty surprises. How much does it cost to convert currencies in my account? You'll always see these fees upfront, so there are no nasty surprises. And you're guaranteed the mid-market exchange rate — like the one you see on Google. How much does it cost to add currencies or move them to a bank account? It's free to add money to your account by bank transfer. There's a small fee for adding money to your account with a credit or debit card. It's free to move money from your borderless account into a different bank account, as long as that bank account is in the same currency. But if you do this more than 10 times a month, there's a 50p charge. Where's the money in my borderless account stored? All the money in your borderless account is securely stored in TransferWise's bank accounts— either in Australia, the UK or the USA. If the address on your TransferWise profile is in Australia, your money's stored in TransferWise's Australian bank accounts. If the address on your TransferWise profile is in the US, your money's stored in TransferWise's American bank accounts. And if the address on your profile is in the UK, your money is stored in TransferWise's British bank accounts. TransferWise Ltd is a designated remittance provider registered with the Australian Transaction Reports and Analysis Centre ("AUSTRAC") IND100428576-001. We’re regulated by the Australian Securities and Investments Commission (ASIC), Australia Financial Services Licence (AFSL) number 456295. 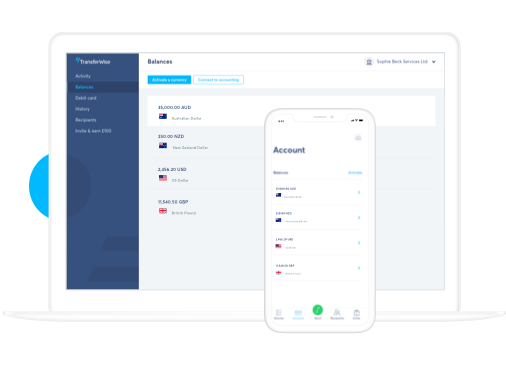 All money in your TransferWise Borderless Account is stored and safeguarded securely in our bank accounts in Australia, the UK or USA depending on the country of residence in your profile. Over 4 million customers have trusted us to move their money around the world. We move more than $2 billion every month at TransferWise - and we take the safety and security of your money seriously.